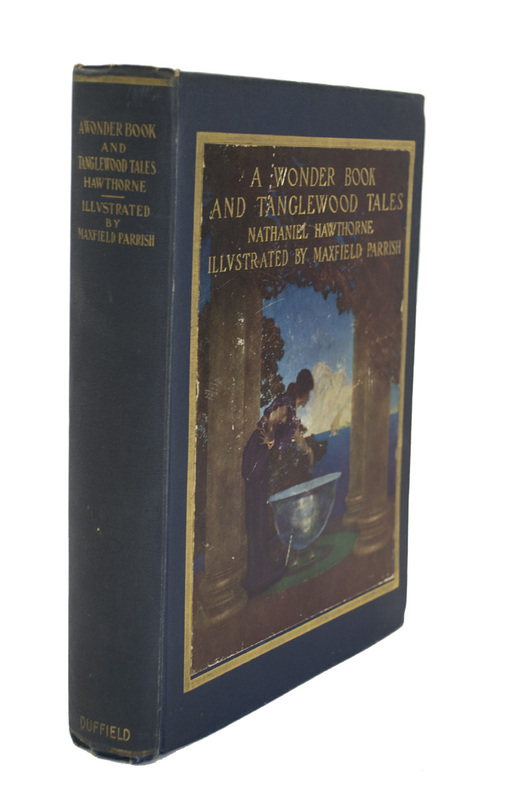 First Parrish Illustrated Edition of "A Wonder Book And Tanglewood Tales"
PARRISH, Maxfield. HAWTHORNE, Nathaniel. Wonder Book And Tanglewood Tales. 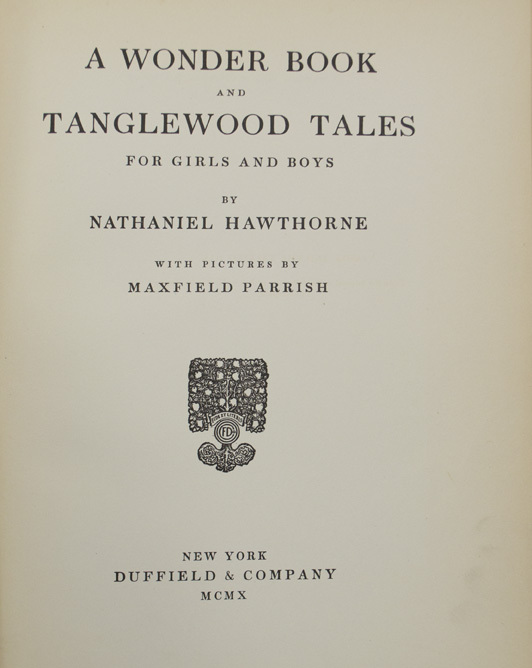 For Girls and Boys by Nathanile Hawthorne. 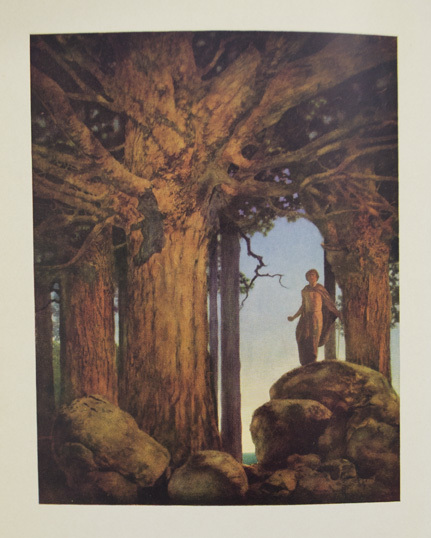 With pictures by Maxfield Parrish. New York: Duffield & Company , 1910. 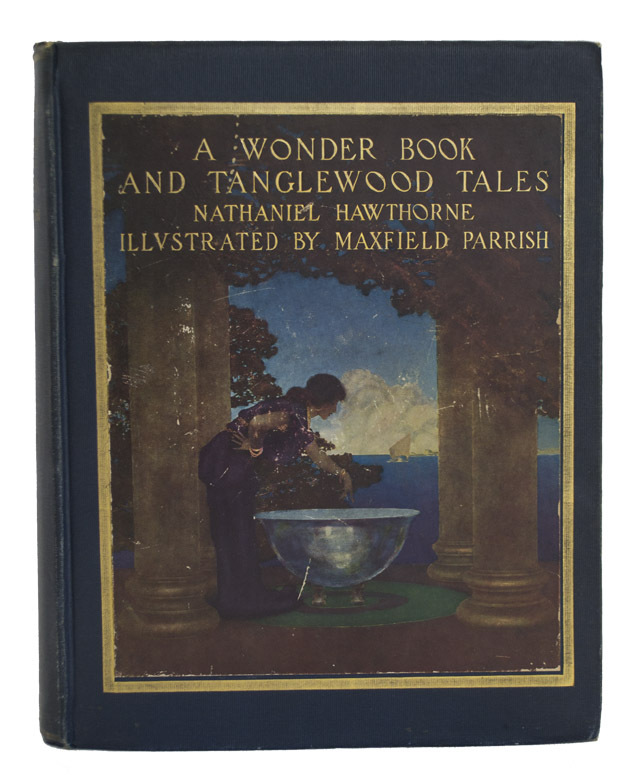 First Parrish illustrated edition. Quarto (9 7/16 x 7 5/16 inches; 240 x 186 mm). With ten color plates including frontispiece. Each of the plates with a descriptive tissue guard, except for plate opposite page 162 which is lacking. Publisher's full navy cloth with color pictorial label on cover (duplicate of the plate "Circe's Palace"), ruled in gilt. Spine lettered in gilt. Pictorial endpapers, printed in light blue. Edges and spine extremities lightly rubbed. Front paper label, with a few scratches. Small printed label on front pastedown. A few pages opened a bit rough. Overall very good. The stories within include: The Gorgon's Head, The Golden Touch, The Paradise of Children, The Three Golden Apples, The Miraculous Pitcher, The Chimaera, The Wayside, The Minotaur, The Pygmies, The Dragon's Teeth, Circe's Palace, The Pomegranate Seeds and The Golden Fleece.